Schaap en Citroen Juwelers opened its first Diamonds Boutique in collaboration with Royal Asscher on 24 May. The Boutique is located at Pieter Cornelis Hooftstraat 142-F and is styled by Monique des Bouvrie. There is an internal passage to the Hublot Boutique Amsterdam. With the opening of the Diamonds Boutique, Schaap and Citroen can add a new concept to its portfolio. The traditionally Amsterdam diamond company Royal Asscher, internationally renowned for its own Royal Asscher Cut and the special relationship with our royal family, embraced our idea and is now also represented with a very generous collection at this beautiful location. The Diamonds Boutique, designed by INEX and styled by Interieur Styliste Monique des Bouvrie, has a modern feminine look in which different shades of blue and smoke glass have been incorporated. The store, located on the corner of Pieter Cornelis Hooftstraat and Baerlestraat in Amsterdam, is spread over two floors. Due to the light from the many windows, the diamonds are best shown. Schaap en Citroen presents the classics and nouveautés in the Diamonds Boutique from her 1-2-5, Highlights, Diamonds and 1888 collection. Rings, bracelets, necklaces, earrings and brooches with diamonds are the eye-catchers here. In addition, Royal Asscher presents a special collection of jewelery, but solitaire engagement rings can also be found in the new Diamonds Boutique. Schaap en Citroen is a Dutch jeweler's house with a rich history dating back to the year 1888. 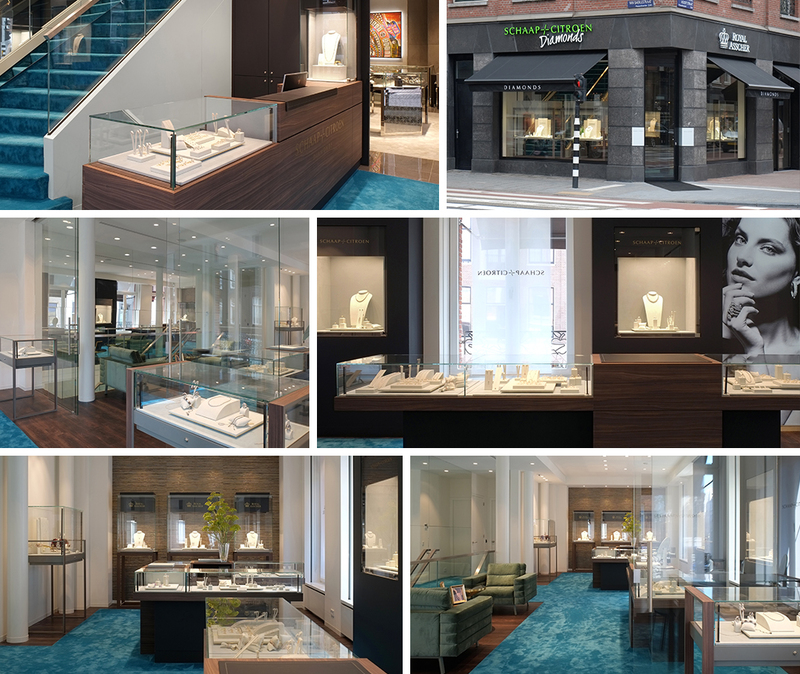 Meanwhile, Schaap en Citroen has 10 jewelery stores in the big cities, including Amsterdam, Den Bosch, The Hague, Eindhoven, Groningen, Haarlem, Rotterdam and Utrecht obtained national coverage. The jeweler's house focuses on the future without losing sight of traditional values.